Dayal (the one who taught us the Mahua vegetable recipe!) and I went off into the forests to explore the monsoon flora and fauna one fine Saturday morning. And we didn’t return on the time we intended to. Dayal contemplating one of the many dead-end paths. 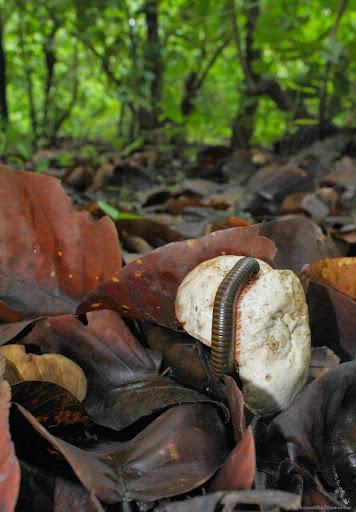 We counted countless mushrooms, fresh under a humid Sal forest, and we saw scorpions black as night. Spiders here hung low from their webs, with some content with the meal they had secured. If you’ll allow me, I’d have called it Mirkwood, and the spiders the breed of Ungoliant, and the maze a curse laid long ago upon this fell lands. But it was none of this – contrary to what I just said, we were enjoying the haunted woods. decomposers, and feed on organic litter in the undergrowth. After an hour of explorations, we realized we were slightly off-track. And we walked in search of the path in a maze of other man-made and animal-made paths. The river roared in the distance. The jungle sank in. Our feet slipped on the mud, so we removed our chappal to tread barefoot. is a way to get lost in the forest. I, and Dayal so very kindly, stopped to photograph a mushroom or two which we thought would make a nice sabzi. 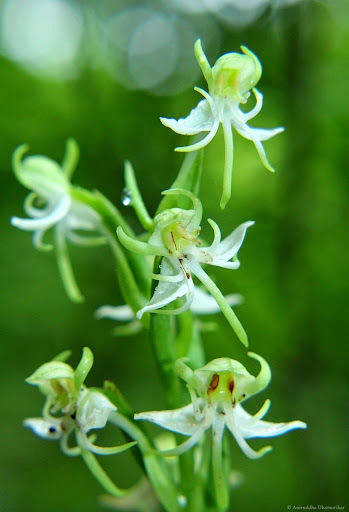 And we saw ground orchids in their purest whites. Then it happened. We walked our first round in a circle. I panicked, and requested Dayal to walk behind me as I hunted, literally, the footprints of people. We walked a new path now, with thin impressions of footprints, and came alongside the river. We knew this to be our beloved Jamunia that I’ve sang about. She was in her feistiest avatar. A thunderstorm had left behind a tangle of trees along the banks, and tones of sand and mud. We went by the bank in the hopes of crossing over it – and sank to our knees. It was not worth risking the river’s swell. Both of us resisted speaking it first, but I broke the ice by telling Dayal we were lost. Dayal finally agreed, and said we were hopelessly lost. I had counted on Dayal who has years of experience of walking alone in forests to say otherwise – but he broke an iceberg I was hoping to avoid. We came back on the path, and resisting going back the way we came, we treaded along the riverbed and came to a deep gorge where a nullah (a rivulet or a large stream) met the river. The path, the footprints, disappeared here. People had come here, but they had vanished – or walked back as we did. Our resistance to walk the same path had backfired, and we were on it again. The skinned mango halved by teeth, and its counterpart a few yards from it, were still lying there. I remember them because I did not want to see them. 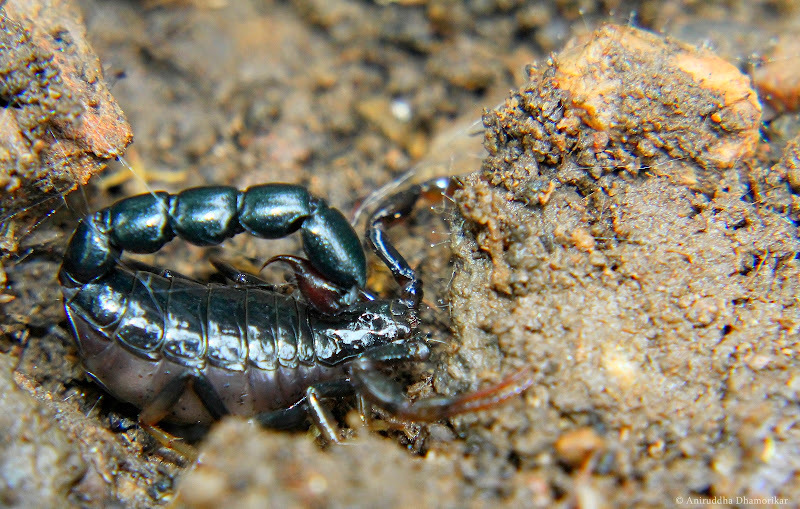 from Madhya Pradesh according to the Scorpionida checklist of India. We finally agreed we were going in circles. The first few instances were reasoned that we went through the same paths to find another path we may have missed. 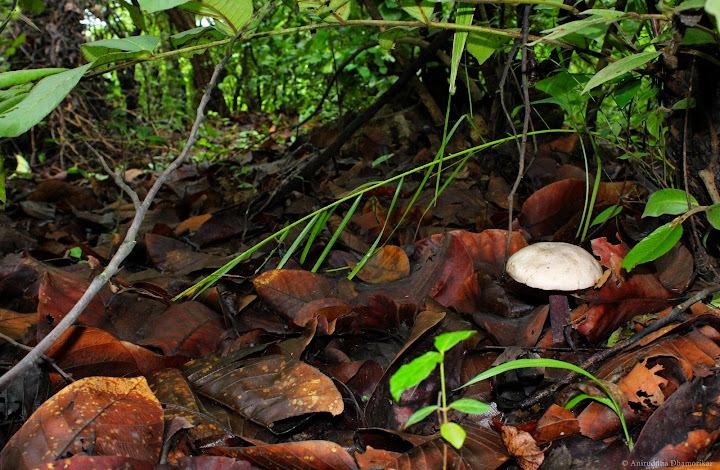 Locally known as Sarai Pihri or Bhondo Pihri (Pihri = any edible mushroom), this mushroom is common in dense Sal litter. A number of studies are looking into culturing wild mushrooms for consumption - this study undertaken by Srivastava and Soreng (2012), makes an excellent read at domesticating wild mushrooms in Jharkhand. And we walked half-panicked yet relishing the rawness in nature. The canopy was short but dense, and no tree grew taller than the other for us to climb and get our bearing. Thick dark clouds made it worse. The camera was set aside, finally to Dayal’s content. And with our footwear in hand, we met Jamunia once again, and argued that we had been here before – I for once believed we had come much, much further than before, but to our horror the path seemed very similar, and further ahead another set of footprints vanished before us. Fortunately, it ran down a slope where another nullah met the river, and up on the opposite bank the path resumed. Dayal took the lead now, and we walked, and walked, as soft drizzle settled on our skin. We were out two hours after we realized we were lost before we had another village in sight. Quite naturally, the news spread to our associates, and we have been talking about it ever since. 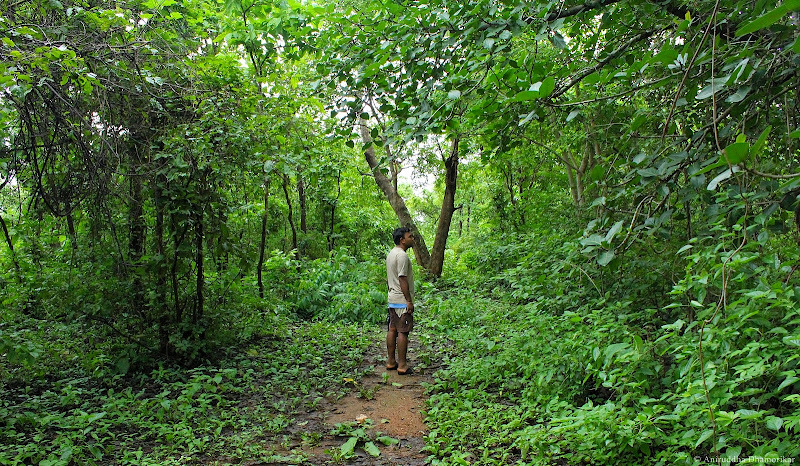 Sukhlal says that that forest is notorious – or sinister – and he who has spent decades living adjoining it, has never come to know it so well. He said he was glad we were out, for the wild-boars are quite common in that forest (fortunately we saw none, or this account would have been different, or there wouldn’t have been one). I was clearly made to understand that it was a Bhoolandara that haunted us. 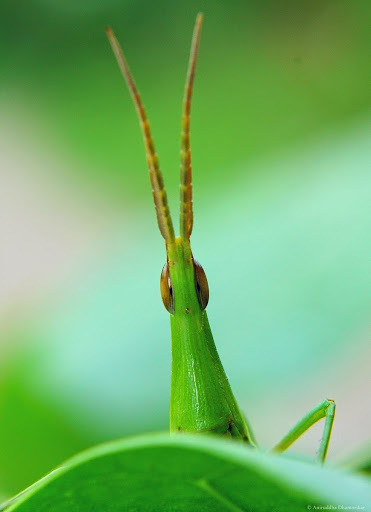 It is common in that forest, they say. They say that it must have got hold of either mine or Dayal’s feet, and made us go in circles in a wicked jest. But a Bhoolandara is not a spirit, or ghost, or a stone, or an animal. Bhoolandara is said to be a plant that no one has ever seen. One step upon or above it, and you’ll be lost. You will not be able to identify the direction your house is in, and the direction you think your house will be in will be a vast, dark forest. I do not know what happened in that woodland, but something did happen. If the second set of footprints had indeed vanished, we would have spent a lot of time thinking about crossing the river, or continuing walking in any direction, and to make matters worse my phone had died before I could use the GPS. Talk about coincidence. Barefoot Notes are short articles or short stories. I realized that footnotes are small but essential to enhance observations and share experiences, but they are often tailing general articles. To avoid footnoting them in general articles, or skipping them entirely, I welcome you to Barefoot Notes, which are generally taken a-foot.